The proliferation of mobile devices presents a unique challenge to companies and organizations. Employee cell phones and other electronic devices present a security hole as devices containing sensitive company information are retired. As part of a comprehensive security policy, organizations need to ensure that these mobile devices are properly erased and disposed of. WipeDrive Mobile can help. WipeDrive Mobile securely and permanently wipes iPhone, iPad, and iPod data. Simply deleting files on a mobile device doesn't necessarily mean the data is gone nor does it provide a proper audit trail. To ensure the data is completely unrecoverable all data must be overwritten. WipeDrive Mobile is initiated from a Windows PC. One technician can wipe large numbers of devices in a quick and efficient manner. 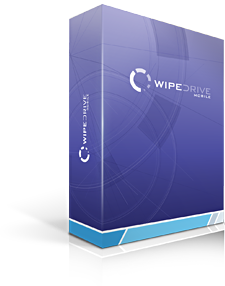 Once the wiping process is complete, WipeDrive will generate an audit report to certify the data has been destroyed and to help you track your inventory. The device may then be re-used or recycled. What Data Does It Erase? WipeDrive Mobile will completely wipe iPhone, iPad, and iPod data. Once the wipe is complete it installs a clean version of iOS, leaving the phone in "like new" condition. WipeDrive Mobile provides bullet-proof, auditable reports to help you track erasures, limit your liability and protect your corporate data. You can save your reports in a variety of formats or export them to a database. Have peace of mind and protect from legal liability with 100% secure and permanent erasure. Enterprise support with guaranteed response times. A solution you can trust - WipeDrive products are used widely by government and corporate clients including many Fortune 100 companies. Comprehensive and secure reports make the erasure process secure and fully auditable. Securely and permanently erase iPhone, iPad, and iPod data.